To the east at Mount Tai (Taishan, in Shandong province), with Liangfu mountain as a barrier. To the south in Guilin, with the Xiang River as a barrier. To the west in Hanyang (a Han commandery east of Lanzhou in modern Gansu11), with Longban (Longshan, a mountain range west of Chang'an) as a barrier. To the north at Yanmen pass, at the west end of the Hengshan mountains in northern Shaanxi, with snow as a barrier. 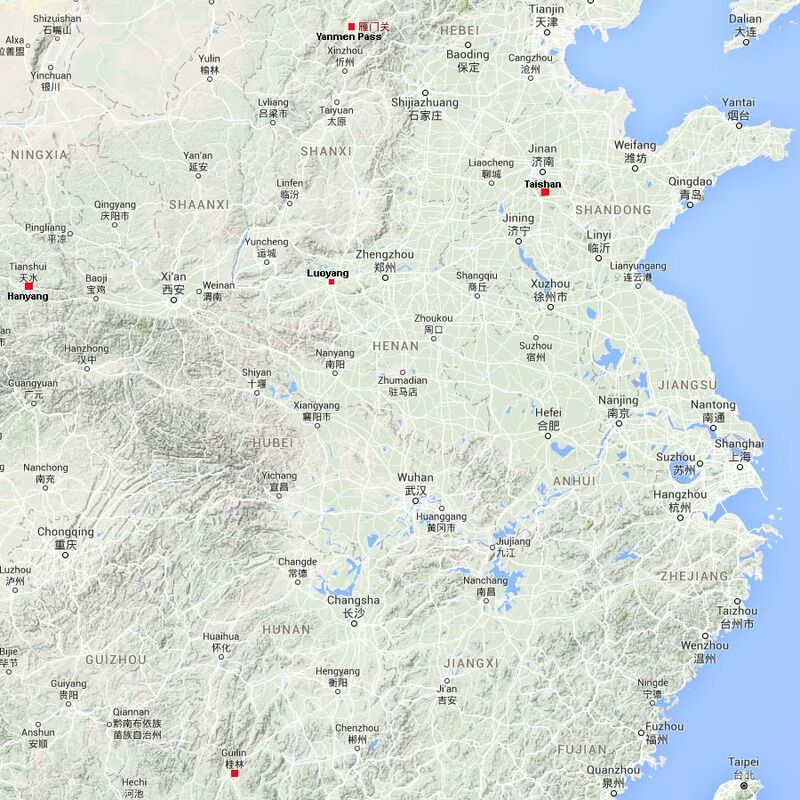 These locations suggest that the narrator is in the Eastern Han capital, Luoyang. Luoyang is in modern Henan province, and Zhang Heng was from Henan. There is only the attribution at front to Zhang Ping, i.e., Zhang Heng; no mention of the melody. The preface in 1618 discusses Zhang Heng. A largely syllabic setting dividing the original text into four sections;14 the words in brackets are not in the original poem. 欲往從之梁父艱。 I would like to go be there but Liangfu Mountain is hard to cross. Yù wǎng cóng zhī Liáng Fù jiān. 側身東望涕沾翰。 As I turn to look east, tears wet my pen. Cè shēn dōng wàng tì zhān hàn. 美人贈我金錯刀， My fair one has sent me a golden inlaid dagger (coin). 何以報之英瓊瑤。 Is this recompensed by the beautiful jade (I sent)? Hé yǐ bào zhī yīng qióng yáo. 路遠莫致倚逍遙， It is too far to get there, so I just wander about. 何為煩憂心煩勞？ Why should I be depressed and weary at heart? Hé wèi fǎn yōu xīn fán láo? 欲往從之湘水深。 I would like to go be there but the Xiang River is deep. Yù wǎng cóng zhī Xiāng Shuǐ shēn. 側身南望涕沾襟。 As I turn to look south, tears wet my collar. Cè shēn nán wàng tì zhān jīn. 何以報之雙玉盤。 Is this recompensed by the pair of jade vessels (I sent)? Hé yǐ bào zhī shuāng yù pán. 路遠莫致倚惆悵， It is too far to get there, so I remain reproachful. 何為煩憂心煩怏？ Why should I be depressed and discontented? Hé wèi fǎn yōu xīn fán yàng? 欲往從之隴阪長。 I would like to go be there but the Longban (Mountains) are broad. Yù wǎng cóng zhī Lǒng Bǎn zhǎng. 側身西望涕沾裳。 As I turn to look west, tears wet my lower garments. Cè shēn xī wàng tì zhān shang. 美人贈我貂襜褕， My fair one has sent me sable: a short cloak. 何以報之明月珠。 Is this recompensed by the bright round pearl (I sent)? Hé yǐ bào zhī míng yuè zhū. 路遠莫致倚踟躕， It is too far to get there, so remain indecisive. 何為煩憂心煩紆？ Why should I be depressed and fretful? Hé wèi fǎn yōu xīn fán yū? 欲往從之雪雰雰。 I would like to go be there but the snow falls too heavily. Yù wǎng cóng zhī xuě fēn fēn. 側身北望涕沾巾。 As I turn to look north, tears wet my handkerchief. Cè shēn běi wàng tì zhān jīn. 美人贈我錦繡段， My fair one has sent me brocade: an elegant swath. 何以報之清玉案。 Is this recompensed by the jade table (I sent)? Hé yǐ bào zhī qīng yù àn. 路遠莫致倚增嘆， It is too far to get there, so I just sigh more and more. 何為煩憂心煩惋？ Why should I be depressed and disappointed? Hé wèi fǎn yōu xīn fán wǎn? 3. 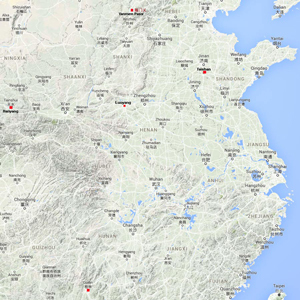 Luoyang and the four "fair ones"
Adapted from Google maps (expand), which of course have only the modern place names. Here is is referred to as 張平 Zhang Ping. Bio/1251 and 10026.1420 張衡 Zhang Heng have three or four people, but the relevant one is the earliest, a Han dynasty literatus 字平子，西鄂人 style name Pingzi, from Western E ("Xi Ao"?) in the 南陽 Nanyang region of modern Henan province. ICTCL, p. 211: although most famous as an early mathematician and astronomer (see online information), he was also an eminent author of fu (he and his 東京賦 Rhapsody on the Eastern Capital are mentioned tangentially in connection with Kai Gu). 4782.647 四愁詩 says only "a poem by Zhang Heng". The structure is mentioned above. An important question from a musical standpoint is whether the recitation of seven character lines naturally leads to a short pause at the end of each line, giving an 8 beat (reduced to 4) rhythm. I often hear seven character per line poems recited this way, so this informs my selection of rhythm for the present melody. Likewise, the tendency for poems to be in couplets informs my decision to treat short opening phrase of each section (verse) as a line, making them all eight line verses rather than ones of seven lines. For another qin song with significance regarding couplets with seven characters in each half see the Intonation for Poetry (詩吟 Shi Yin). The melody itself uses huangzhong tuning (raised fifth string, lowered first). Early copies were included in Wen Xuan, Folio 29 (Chinese edition, page 1303) and Yutai Xinyong. As for published translations, there are at least one complete one and two partial ones. Four Sorrows, Four Poems, in Birrell, pp. 276-7. Begins, "The one I love lives on Mount Tai. I long to go after him, but Mount Liangfu is rugged." Four Melancholies, in Allen p. 28 (1st verse only). Begins, "Oh, the one I long to be with is on Tai Mountain; I too would like to go along the Liangfu slopes." Begins, "In Taishan stays my dear sweetheart, but Liangfu keeps us long apart." 10. The four "美人 meiren"
The poem itself gives no specific gender references. With literati often posted to great distances one might initially guess that the four friends were more likely men than women (unless Zhang Heng himself had previously been posted in the four directions). The exchanged gifts may also suggest lovers. There are a number of places in China called Hanyang, best known being the city now a part of Wuhan in Hubei. The mountain in Sichuan of this name might be considered, but the reference that makes most geographical sense is the area around 天水 Tianshui in what is today southeastern Gansu province. During the Eastern Han dynasty this area was a commandery called Hanyang. Nearby, in the spring of 138 CE, there was an earthquake here so great that a seismograph in Luoyang invented by Zhang Heng himself detected it. Without the opening phrase of each verse ("the nth lament says"), the rhyme scheme of each verse suggests the seven lines should be grouped as three lines then four lines. However, the opening phrase at the beginning of each verse can easily be sung so it sounds like a line of similar importance to the other seven, thereby suggesting an even more regular structure to the melody, each verse having 8 lines of two phrases (couplets) each. This poetic structure is then emphasized in the music by the fact that for the first three couplets of each verse the first half almost always ends on sol or re, then the second half ends on do; in the fourth couplet both halves usually end on do, but the general pattern of what in Western music would be called a leading note (re or sol) resolving to the tonic (do) is quite clear (though m.37 of my transcription has an uncertain note and m.41 has an exception). There is more discussion of such structures here). Although the poetic structure, as shown in the previous footnote, is quite regular, the ornamentation on the tablature for the melody suggests that the music is somewhat less regular. Perhaps this could be seen as evidence that the song line and the qin line were not intended to go together strictly in lock-step, as is the common practice today. Because rhythm is not directly indicated in qin tablature some people argue that there is no rhythm; others say that it should be rhythmic, or at least have a pulse. My own understanding of the rhythmic structure of early qin melodies is that they are fundamentally structured, but that the more they are played the freer the rhythms may be interpreted. The nature of Si Si Ge, being a lament, suggests it be played expressively, i.e., quite freely. The standard version apparently has 金 jin (gold), while the music setting has 琴 qin (the music instrument).